James Norcliffe is one of New Zealand's most widely published and anthologised poets. In Dark Days at the Oxygen Café, he looks over the shoulders of many characters and creatures, both real and imagined, and takes us deep into uncanny valleys. Poems about Seneca and James Dean sit alongside poems about a Turken dictator and an owl man. We share in a portentous UFO sighting, a small celebration for Laika the space dog, and Peter the Great being offered an Air New Zealand lolly. These scenes from myth, history, pop culture and personal experience make for a wryly funny, deeply felt collection that contemplates the quirks of shared and personal histories. 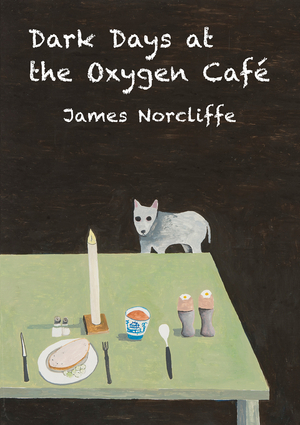 James Norcliffe's poetry, short fiction and children's writing has been published widely in New Zealand and elsewhere, including in London Grip, Harvard Review, and Manhattan Review. His poetry has been anthologised in collections including The Oxford Book of New Zealand Poetry in English, New Zealand Love Poems: An Oxford Anthology, Contemporary New Zealand Poets in Performance, and The Best of Best New Zealand Poems. He has also been the recipient of many awards and fellowships. Dark Days at the Oxygen Café is his ninth poetry collection.